FAQ for UK and overseas visitors. I've been told I should enter the National Honey Show but have no idea how you go about this? Firstly you need a copy of the schedule. The schedule will list all the competitive classes that can be entered. Read the schedule carefully and make sure you understand all the rules and regulations. Remember everything you need to know will be in the schedule! Can I attend a workshop without paying the admission fee? No. Only National Honey Show members and those with valid day tickets can attend lectures and book into workshops and/or demonstrations. Also see Workshop Booking Enquiries and FAQ. Are there special discounts for groups coming to the show? No. The cost of daily admission is £12.00, which, considering what is on offer, is very good value for a day’s entertainment. 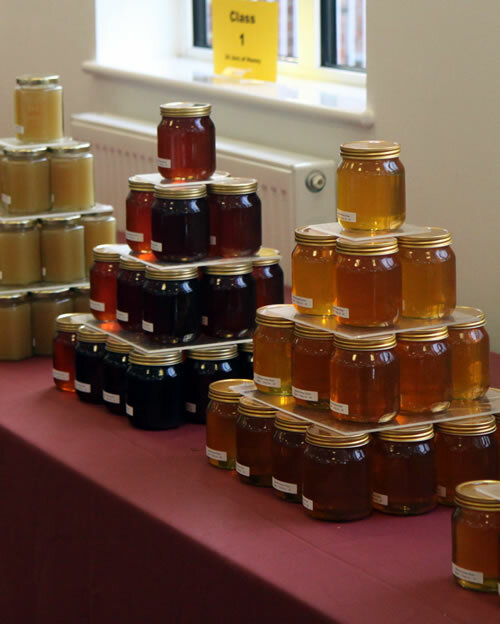 If you want even better value for your money, why not become a member of the National Honey Show? at £20.00 via the Membership Subscription page. Payment taken by PayPal or debit/credit cards or print out an application form and pay by bank transfer. This will give you admission for all the three days, entitle you to a copy of the schedule, and allow you to vote at the National Council. Do I have to pay to visit the trade show? Yes. Your entry fee (Membership £20 for all three days or Day Visitor £12. Accompanied children under 16 free of charge) covers admission to the competitive classes exhibition, the trade / educational show and lectures. The trade / educational show is open: Thursday 12 to 6pm, Friday 9am to 6pm and Saturday 9am to 4.30pm. Will you be allowing new beekeepers free admission to the show again this year? No. This offer has now ended. Will there be somewhere for me to change my lids before I check in my exhibits? Yes. tables will be available, but honestly, we do not recommend that you do that. There is a lot of movement going on at the entrance stirring up lots of dust. It is much better to do your final preparations at home. Judges would much prefer to see a bit of honey on the inside of the lid than a film of dust on the surface of your honey. What about the new labelling regulations? The situation at the moment is not entirely clear as the new regulations have been interpreted slightly differently by Trading Standards departments in many areas. If you are selling honey it is best to have your labels checked by you local office. For the purpose of the National Honey Show all classes requiring the exhibitors own labels must comply with Rule 24. Although I won a Blue Ribbon at my local show, I feel very diffident about trying at the National. What do you think? Don’t be silly! Go for it, and give it your best. I live in the Midlands, and the thought of getting my exhibits to the show horrifies me. What do you suggest? Thornes and Northern Bee Books have again most kindly offered to transport exhibits to and from the show. Get in touch with them. Or else do what a lot of other people do, and arrange for one member of their branch to transport all the branch exhibits by car, and then for the branch to pay the driver’s expenses. What are the last dates entries are accepted? Entries can be emailed to the Entries Secretary please pay by BACS, see entry form. Entries for all classes (except 95-102 inclusive, i.e. essays, videos, microscopy slides and photographs-see below) must reach the Entries Secretary by the 8th October 2018. Late entries may be made until 15th October, but will incur an additional late entry fee of £10.00 Entry forms for classes 95-102 inclusive, i.e. essays, videos, microscope slides and photographs) must reach the Entries Secretary by 10th September 2018. No late entries permitted. How do I register to attend the National Honey Show? There is no need to “register”. 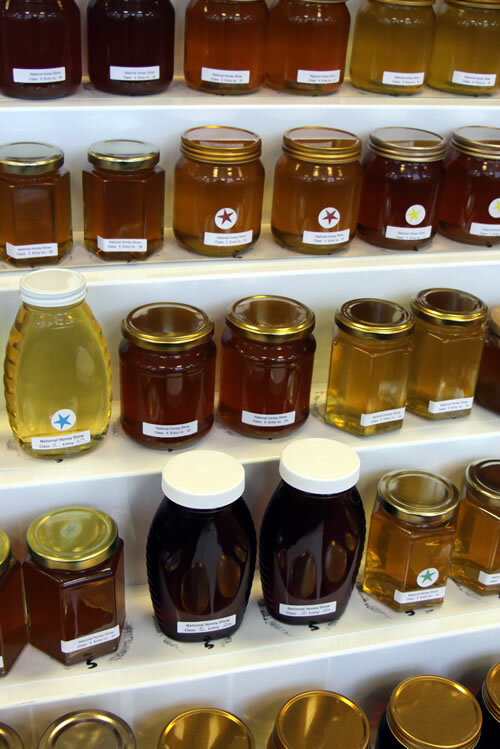 Just arrive at Sandown Park Racecourse and either pay £12.00 for each day’s admission at the door, or £20 online to become a member of the National Honey Show, and this will entitle you to free admission all three days of the show. What about arranging accommodation for those attending the show? Booking accommodation is entirely your responsibility. I will need a Visa, so how do I get a letter of invitation? Apply to the Assistant Secretary, Mr Mike Duffin, who will advise you about the procedure. Use the Contact Email. We strongly recommend that you start to make your preparations in good time, and NOT to leave everything until the last few days. Do you give financial help for overseas visitors’ travelling and accommodation expenses? I am afraid that is not possible. The National Honey Show is itself a charity, run entirely by voluntary and unpaid helpers. All our resources are used for staging the show each year, and we have no further funds available. As much as we would like to help you, I regret that the answer must be a definite no. I would like to exhibit some of my honey, but I wonder whether there will be any problems getting it into the UK? If you are bringing in a large quantity, you may well have problems, unless your country has exemption from the EU Council Directive 95/23/EC. I advise that you check up about this with HM Customs and Excise. If however, you are only bringing in a few jars in your hand-luggage – the sort of quantity you would bring as presents for your relatives - then there should be no problem. Any interested beekeeper wishing to enter exhibits into the NHS from outside the UK should write to Bernard: b.diaper @ hotmail.com. (remove spaces and last dot) for further advice. I am interested in your honey show but my English is not good. Are there any translators available, particularly for the lectures? I am afraid that we are not able to provide translators for other languages. This is beyond the show’s resources at the moment. If you still haven't found an answer to your question? we offer email support via our Honey Show Mailing List.